Mike Frerichs Is Surprisingly Silent On Democrat Day At State Fair? 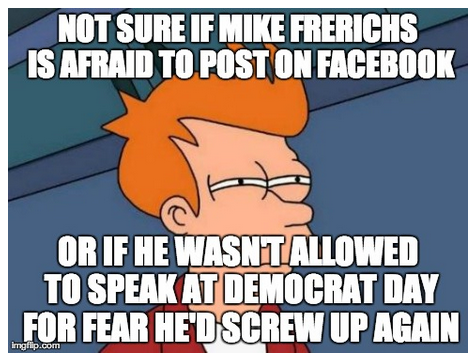 We've been waiting and waiting and waiting for him to post something on Facebook and even scouring some of the media coverage from Democrat Day at the Illinois State Fair and the best we can tell, either Mike Frerichs is deathly afraid of posting something silly that we can ridicule or...he didn't have anything to say yesterday. Or...the Democrat leadership team didn't allow him to talk for fear that he'd say something 'ridiculous' or as some folks call it 'pull a Frerichs'.